There is no better culinary accompaniment to a dram of Dalwhinnie’s finest single malt scotch whisky than some of Hog Roast Dalwhinnie’s fabulous locally-sourced pork. We are the number one supplier of hog roast catering services in the area and we select only the finest quality locally produced meat. 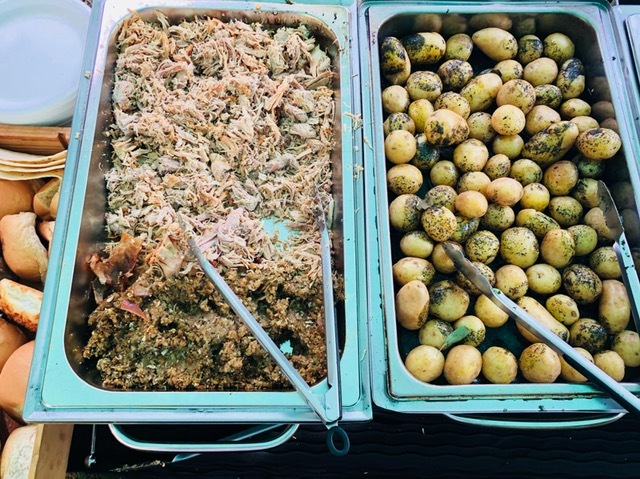 During our many years of experience, we have perfected the art of hog roast cooking and taken it to a new level with our contemporary menus that are suitable for any size or type of event. Thanks to our highly skilled chefs and ultra-modern cooking equipment, we can produce incredibly flavoursome and succulent meat for all occasions. We are able to cater in any environment for any amount of people whilst always delivering the same unbeatable quality. The slow-roasting method is just as effective for all different type of meat, not just our fabulous pork, and if you would prefer another option, you can choose from sirloin of beef, organic chicken, or spring lamb, amongst many others. Here at Hog Roast Dalwhinnie, we don’t just cater for meat lovers either. We have vegetarian options across all of our menus, which we put just as much care and effort into preparing as our slow-roasted meats. We pride ourselves on our ability to cater for all diets so that if you choose us to provide the food for your event, you can be assured that none of your guests will have to compromise or be left with uninspiring dishes. Our approach to customer service is just as flexible as our approach to catering and we will always follow your requirements to the letter to ensure we present and serve your food in the style best suited to your event. If you want a big buffet for everyone to dig in, we can be on hand to help your guests out if needed, or if you would like your event to be more formal in nature, we can provide professional table service and even supply our own front of house staff to greet your guests with a platter of canapes and a glassy of bubbly. The Hog Roast Dalwhinnie team have the skill, experience and commitment to meet all of your catering and service needs for any type of event in the area.